Gold Country Casino Resort has more ways for you to win with our exciting promotions! Must be a member of The Gold Experience Club to participate. Sign up and start earning cash and prizes immediately! There is always something fun happening at Gold Country Casino Resort! You are only 3 steps away from Instant Rewards! Sign up today, play be REWARDED! It's as Easy 1, 2, 3! 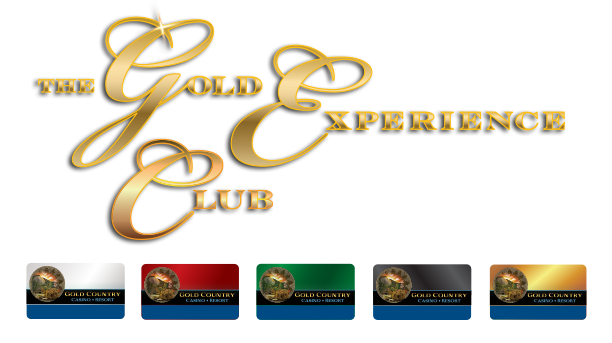 At Gold Country Casino Resort we're always trying to show appreciation to our great community. If you're a local head to our eClub and get your Locals' Advantage sticker added to your players club card today! Fridays & Saturdays: Hop on into Gold Country Casino Resort this March and April. Leap through the lilly pads for a chance to win up to $5,000. • Winners will receive 3 plinko pucks to drop in the plinko board and receive a prize equal to the total amount after all pucks are dropped. 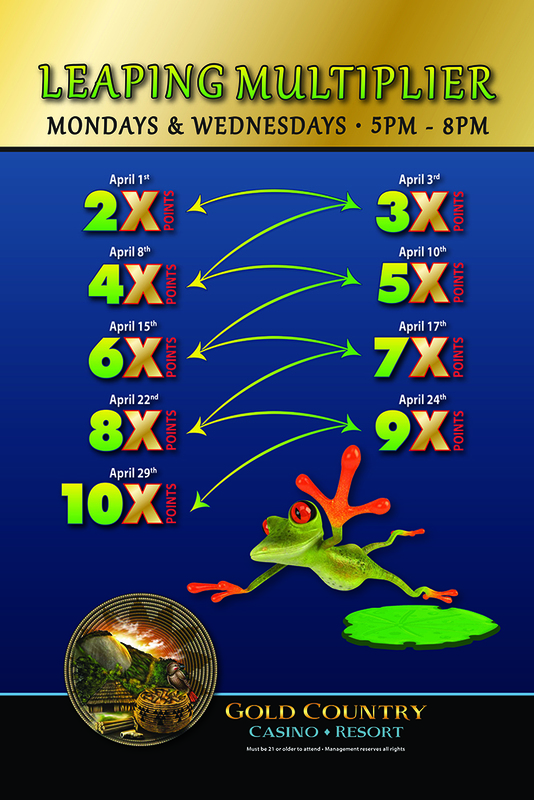 • If the winner lands on a fly they will advance one space on the frog hop game board. • The last drawing of each promotional night the prize will be doubled! • On Saturday May, 4th we will have two Grand Prize winners of $10,000 each! Fridays & Saturdays: The clock is ticking, fight your way to the pit for a chance to win your share of $1,000 a night! All year long the first Sunday of each month is Super Senior Day! Seniors will be able to double all their Club 50 beneifts! The first Saturday of each month beginning November 5th, we're having a Rip Roaring $30,000 Bingo Celebration! Each Saturday will feature 38 games total! 26 games paying over $1,000! Over $30,000 in guaranteed payouts! Every Sunday and Tuesday it's Senior Day at Gold Country Casino Resort! Join us every Tuesday from 6pm-8pm for our Free 4 All Open Hot Seat Slot Tournament! 5 Rounds - 12 players per round. Only one round allowed per person. Prizes totalling $1,000 in free play! Must earn 500 points in the previous 28 days to qualify. 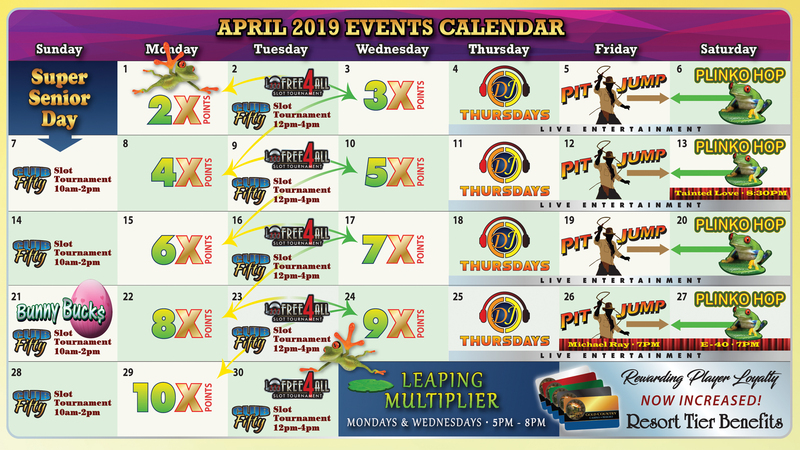 Visit us any time during your Birthday Month and receive $10 in FREE PLAY! Free play added to your eClub card automatically during your Birthday month. Earn 500 points in the previous 28 days to qualify.